Our English newspapers have been covered with pictures of the actress Joanna Lumley bedecked with marigolds being welcomed by the Nepalese as the champion of the Gurkhas. Joanna’s success in making the British government overturn their churlish resistance to giving the Gurkhas British residency after a lifetime of service in the UK army is a typical example of her forthright personality. 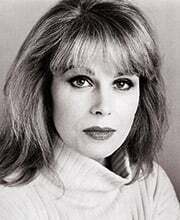 Of course, having been combative and resplendent as Purdey in The Avengers, and then wonderfully decadent as Patsy Stone in Abfab, it is only too easy to see her only as a popular screen actress – Joanna also has 102 episodes of Coronation Street to her credit, and 34 episodes of Sapphire and Steel. She has done some theatre, but curiously, she has done very little radio. However, when we came to record Noel Coward’s ever-green comedy Blithe Spirit, the director, Sheridan Morley asked her to perform the part of Elvira, the first wife – deceased – of Charles Condomine. No one is more surprised than Madame Arcati herself when her psychic power brings Elvira back into Condomine’s world, upsetting the balance of his marriage to his second wife. Now, audiobook drama is a very different medium to work in for someone accustomed to a camera, but Joanna accustomed herself to it very quickly, reprising a role she had played in the theatre. She was surrounded by a cast of friends – Corin Redgrave as Charles Condomine, Kika Markham as Ruth; and with Thelma Ruby as Madame Arcati, the two days recording in Motivation Sound Studios were good fun for all. So, if you haven’t noticed our recording, or Joanna’s rare audiobook drama performance, catch up with it on CD or download, and have some summer fun. With the right sales and distribution, it may even top the audiobook charts in Nepal. There is no doubt that having a star in the studio makes for a very different atmosphere. It is noticeable right from the start, when we gather on the first morning for a read-through. This is important, because it is the only time that we all hear the play from beginning to end (until the final edit!) and when everyone can hear the characters. It is often said that in radio drama, casting is 80% of the task – get it right and the recording just flows. Make a mistake, and the director can face a tough job: perhaps the voices are too similar; or the nature of the performances are too dissimilar, one going for larger than life and the other for minimalism! In a stage production, there is sufficient rehearsal time to sort this out…but in audio drama there isn’t. One read through, then rehearse/record! And often we record out of order, in order to maximise efficient use of actors’ time, or because of props. With modern mixing desks, one can change atmosphere quickly from one setting to another, but it can still be an undertaking to change from inside the castle to outside the castle – from stone floors to grass! Immensely skillful, these career radio actors know just how much to adjust their voices to suit the situation, just how to approach a microphone to ensure that it sounds as if they are coming across a meadow, or entering a room, or turning away in disgust; just how to stab an enemy or fall dead to the floor without sounding odd – and all without a trace of a script rustle. They create magic by their experience and sleight of voice and make Agincourt come alive. Audio dramas are expensive to record but we do them as often as we can – and most actors – such as Joanna Lumley – endeavour to make time for them. They know that when they come to the Naxos AudioBooks studio, they have the added benefit of doing a great classic script, where the words flow and the characters have depth. We have a growing list of dramas. The bedrock is the 11 key Shakespeare plays (Othello twice!) we have made… and we have reissued one classic radio recording, John Gielgud’s Hamlet (1947). There are eight recordings of nineteenth and twentieth century plays, from Lady Windermere’s Fan to Pygmalion to Samuel Becket; but there is also Sophocles’s Oedipus. There is growing list of historic radio recordings – Robert Donat as Becket in the original recording of Murder in the Cathedral came out last month, but it is also worth checking out The School for Scandal with Edith Evans and Cecil Parker. And if you want to hear our great Joyce reader, Jim Norton, in another role, listen to Conor McPherson’s Port Authority, an intimate play from one of the leading contemporary playwrights. But, perhaps bedeck Joanna Lumley with virtual marigolds, and start with Blithe Spirit!